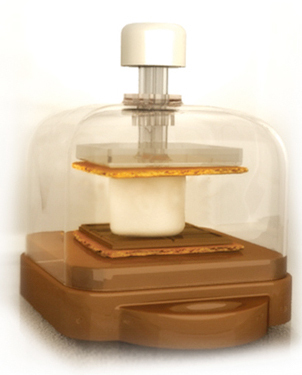 Unfortunately, the cold, modern, technological world has given us the Micro S’Mores Maker, a damnable machine that automates the s’more-smushing for us. Worst of all, it does this in only ten seconds. The world may never again see an unsmushed s’more, except out in the wild. Which might not be such a bad thing—back to nature as it were.